If you live in a world where you can afford to drop $9556 on an enormous, water-cooled gaming PC with four (four!) discrete graphics cards, I envy you. But if you’re thinking of taking the plunge with Primordial Computers’ latest gaming machine, the Medusa, I’d encourage you to look before you leap. As befits its name, the Medusa is a monstrous computer, with clear tubing snaking through its interior carrying neon-green-tinted coolant. The CPU and each of the system’s four (four!) GPUs have corrosion-resistant nickel-plated water blocks bolted to them. Apart from the absence of a custom paint job, the Medusa is the epitome of excess, with a strip of LED lights festooned around the interior of its gargantuan Corsair Obsidian Series 900D Super Tower case. Primordial erred in failing to create some kind of mechanism to support the four Nvidia GeForce GTX Titan video cards that endow the Medusa with the power to crush gaming benchmarks. Considering that the Medusa is a custom-built rig, Primordial should have come up with an attractive brace to support the cards and take the strain off of those slots. And that wasn’t the only thing to go south (pun intended) during my evaluation. The Velcro holding an LED light strip inside the case came unglued and fell off right before we packed the machine to send it back to Primordial. The Series 900D case measures an impressive 25.6 inches tall by 27.2 inches deep. It will fit under a standard 30-inch-tall desk, but just barely. It has room inside for four 5.25-inch devices and up to six hard drives or solid-state drives. Our review unit featured two 120GB SSDs in RAID 0 for blazing-fast speed, supplemented by a 1TB, 7200-rpm hard drive for practical storage. Primordial also put a Blu-ray burner inside. A massive radiator, with three large cooling fans, was mounted inside the top of the case, with four more large fans mounted at the bottom. All the wiring was neatly tied away and hidden as well as possible. Primordial's Medusa is a true beast of a PC. Primordial decided to stick with Intel’s Sandy Bridge architecture, since that’s the company’s only CPU family with a hexacore processor (specifically, Intel’s Core i7-3930K stably overclocked to an impressive 4.5GHz and paired with 16GB of DDR3/1866 memory). But having more cores doesn’t automatically result in higher performance with every application. The Medusa crushed the competition in the gaming-oriented portions of our testing suite, because those games and benchmarks could take full advantage of its plentiful CPU and GPU cores. With the 3DMark Fire Strike Extreme benchmark set at a resolution of 2560 by 1440 pixels, for instance, the Medusa racked up an impressive score of 12871. Compare that with the results we saw from the Haswell-powered Micro Express MicroFlex 47B, which came to us with just one Nvidia GeForce GTX 680 video card and scored 3393 on that same benchmark. 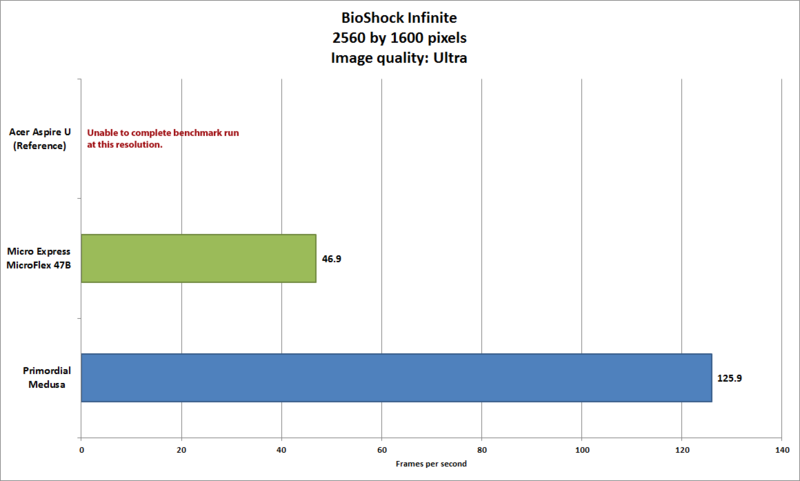 Switching to real-world game benchmarks, the Medusa delivered an impressive 125.9 frames per second in BioShock Infinite with visual quality set to Ultra and resolution at 2560 by 1600 pixels. The MicroFlex 47B was able to squeeze out just 46.9 frames per second at those settings. We were also able to set up a triple-head array of 30-inch displays to play Dirt Showdown—at resolution of 7680 by 1600 pixels, with maximum quality settings—at a stunning 46.6 frames per second. But games are only one element of our benchmark suite. We include a host of other tests because we expect that you’ll also want to explore creative pursuits (such as editing digital photos and video, and transcoding audio and video files), surf the Web, and generally be productive with your new PC. After all, few people can afford to drop nearly $10K on a new computer just to play. WorldBench 8.1, which considers performance with creative and productivity apps as well as games, demonstrates a quad-core Haswell can outperform a hexacore Sandy Bridge CPU. On several of those nongaming benchmarks, the Medusa’s performance was closer to the middle of the pack, because not every app can take full advantage of six CPU cores and four video cards. The Medusa scored very high in GPU-accelerated image editing—no surprise—but it was slightly slower than the MicroFlex 47B at audio editing, and it was only on a par with that machine in our video-editing test. 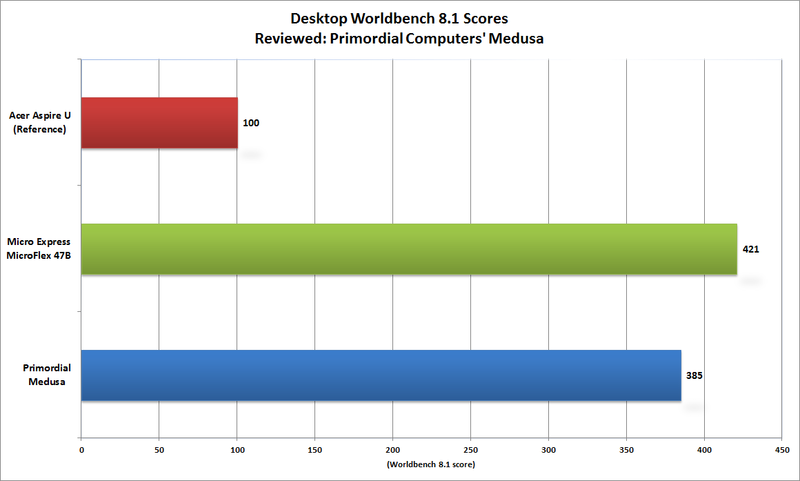 So when all was said and done, the Medusa delivered an impressive Desktop WorldBench 8.1 score of 385—which means that it was 3.85 times faster than our reference desktop—but the MicroFlex 47B topped it with a Desktop WorldBench 8.1 score of 421. If you’re looking for a pure gaming rig, the Medusa delivers what you need. We haven’t tested anything faster. But anyone spending this kind of money on a new PC should expect polish as well as power. And on that front, the Medusa leaves us stone cold. Editor's note: This story was updated on July 17, 2013 to add the manufacturer's rebuttal to our opinion of the need for additional for the four video cards. We also added the resolution used to test gaming across three monitors, and we corrected the review to indicate that the LED light strip fell off because the adhesive backing on the Velcro attached to the enclosure failed. This machine is the epitome of gaming excess. That it doesn't look like it is a plus if you don't like to flaunt your wealth, and a minus if you do.